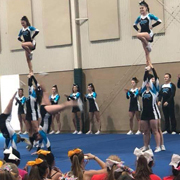 ONLY Spirit has the knowledge, skills, and techniques that will take your team to the next level and keep them on top of their game. 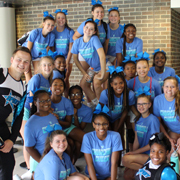 At Spirit, every team feels like the most important team at camp. It doesn’t end with camp, either. Spirit is here to help all year long! Call today 586-281-3372 or email info@northamericanspirit.com! Proven, research-based stunt safety and techniques! Cutting edge techniques from all over the country! Former State and National Champions on our one-of-a-kind, hand-picked staff! Directors and Assistant Directors overseeing every camp! Private coach assigned to every team! Certified Athletic Trainer on staff! Customized format- choose the classes you wish to attend! Motivational experiences that make a lasting impact! Choreographed camp material and professional music! 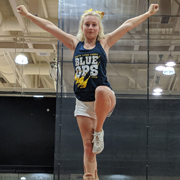 Hundreds of unique choreography and stunt ideas each summer! Click here to register for the Coaches Workshop, Middle School Camp, Competitive Edge Camp, or to schedule your Private Camp! A traditional cheer camp setting at Grand Valley State University. Beautiful campus, air-conditioned dorms, and excellent food! Exclusive Advanced Skills Camp with expert guest instructors from around the nation! Professional instruction in a luxury setting with indoor, matted practice space. Bond with your team when the day is done at America's Largest Indoor Waterpark! New for 2016- extended Final Day! 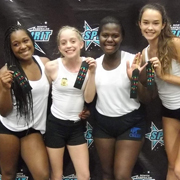 Get the best of what Spirit has to offer- two full days of stunts and skills ONLY! Optional overnight package includes meals, waterpark passes, and overnight stay at the Bavarian Inn Lodge! This camp provides top-notch accommodations perfect for team bonding! Indoor, matted practice space- including air-conditioned gym! Enjoy the pool, paddle boats, and bonfire during team time! "We love learning such great technique and always take away something new!"